El Paso, TX/Southern New Mexico. – At 6 pm on Saturday, April 13th, BNHR will mark two decades of struggle for human rights with our 20th Anniversary Awards Dinner. BNHR will reflect on the power of an organized and educated community. We will reflect on our struggle against policies hurting our families, and instead offering solutions that uplift our humanity. After twenty years we know that we are not the problem, we are part of the solution. It is clear that our fight for human rights is far from over. However, without the vision, advocacy, and fortitude of those struggling to keep our communities safe, our families would be worse off. On April 13th, join us as our communities honor these efforts and successes. Honorary Recognition to Carlos Spector, Blanca Navarrete and Libra Foundation. The program will feature remarks from keynote speaker Congresswoman Veronica Escobar. There will also be a cash bar and silent auction. 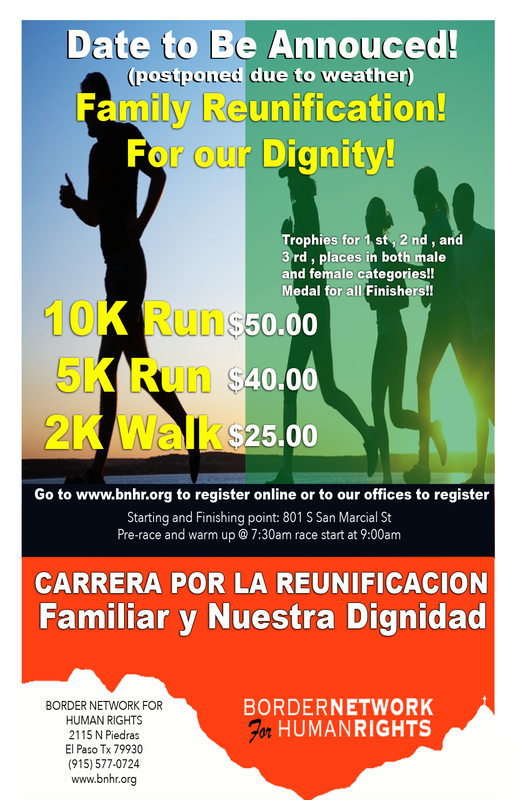 Tickets are available by contacting BNHR Administrator Marco Perez (mperez@bnhr.org or 915-433-7748). Next story BNHR Statement Responding to CBP Commissioner Kevin K. McAleenan’s Remarks on Asylum Seekers.